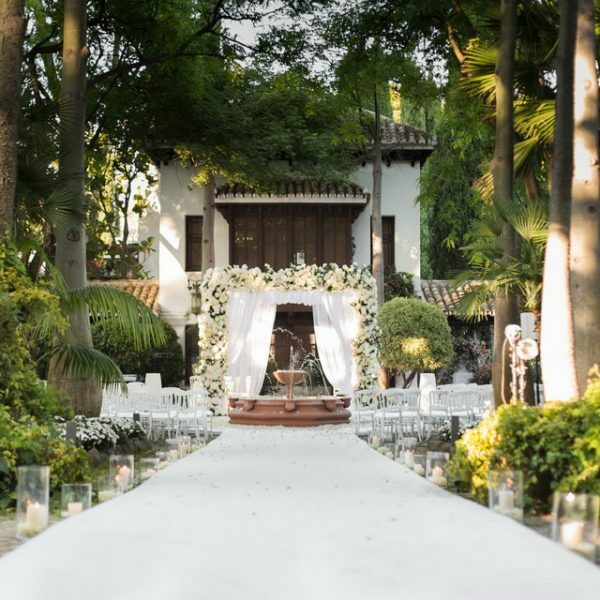 Pretty, elegant and intimate weddings are possible on the Costa del Sol. Like this one that we planned for a very special couple some weeks ago. Our clients, S&D, had booked the restaurant direct so what they needed help with was the decoration and final details. Pedro Navarro Event Styling got involved and as usual was not a disappointment. They provided the Napoleon chairs, table cloths, cutlery, glassware and flower decorations. Our charger plates and Romantic collection complemented very well with all the decoration items. Lavender bags were given as favours, in Italy (where the couple come from) people believe that it brings happiness and peace to our lives. The cake, vanilla sponge with “dulce de leche” and chocolate covered in buttercream, was provided by Divinas Tartas. The cake topper was made by Knots Made with Love. And the cake decoration was a mixed effort between the Pedro Navarro team and us using fresh flowers and macaroons, inspired by a fabulous cake maker from Canada. Thank you so much to Nani de Perez for being available to cover this special occasion, as you can see the pictures are lovely.